Volvo 5 Cyl Turbo, 2.3Ltr. 20V white Engine with a G4 extreme Red ECU. Stock 60 - 2 Trigger System on Flywheel with reluctor Sensor, Trigger 2 / Sync with stock Hall Sensor on Camshaft. Made the first Test Drives and got Trigger Error Counts, always in the same rpm range between 4300 - 5500 rpm. 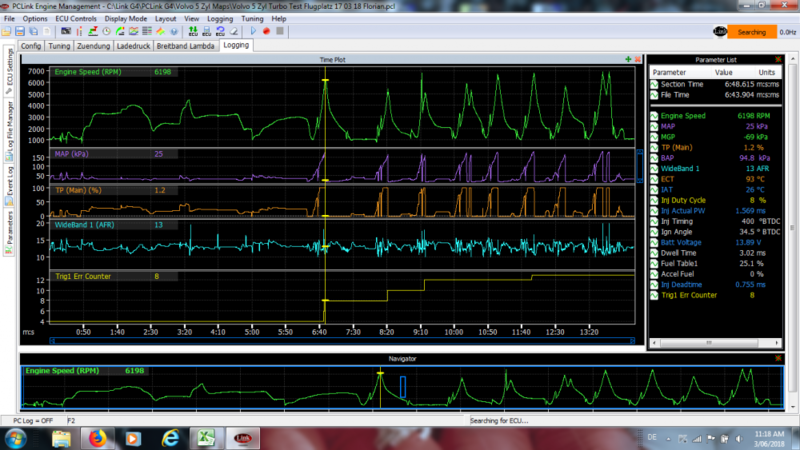 When the errors occur the car hesitates / eventually missfires and then revs clean up to 6200 rpm. We tried a few different Trigger 1 Arming Thresholds in the 4000 - 6000 rpm range with no luck. Which Arming Thresholds do you recommend? Any other suggestions regarding the Trigger Error? I think you will really need to get an oscilloscope on this to see why the ECU is not happy with the signal. Do not drive it in anger like this as it could hurt the engine. It is unlikely to be arming threshold related as high tooth count wheels like this will usually put out very high voltage at high RPM so it should be miles away from the arming threshold. More likely I would say is either the polarity of the crank sensor waveform (wired back to front) or possibly the position of trigger 2 tooth in relation to the crank gap. To check either of these you really need a scope. Do you know anyone with a G4+ ECU you can borrow to use the triggerscope or a mechanic/electrician with a standalone scope?